Have you ever been mindlessly scrolling through pages and pages of food on Pinterest when one dish jumps out at you? You pin it on your "omg yummy" board and definitely plan to make it for that one party coming up in a few weeks. But a few weeks isn't soon enough. You need it. You literally need it right now. You can't stop thinking about it because it is the stuff of dreams, the nectar of the gods, the greatest good of all. Maybe that's never happened to you, but it's a feeling I know all too well, and it happened when I found these gooey cookie dough butter bars. Yes. Gooey butter. And cookie dough. 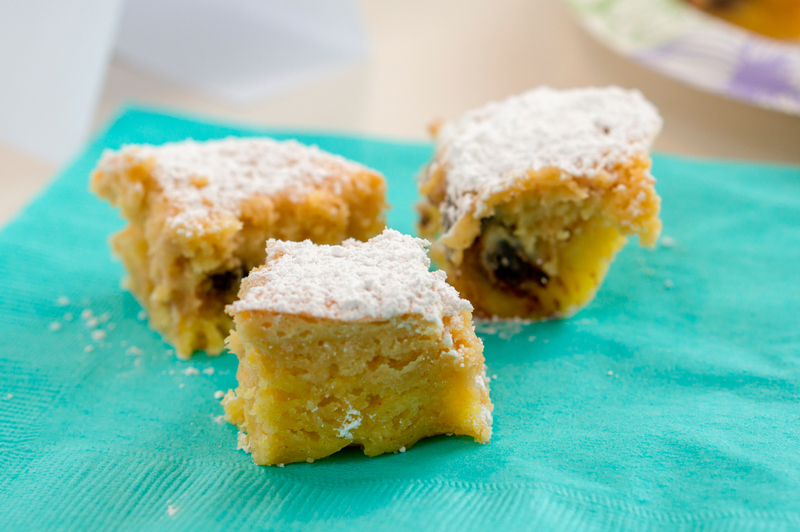 Baked together into a tasty dream bar, and with a generous dusting of powdered sugar on top. It's got all the buzzwords. So maybe you just had your first midterm and it didn't really go well. You'd like to eat to forget. You should make these. Or maybe you went to the EOC last week and scored an insane internship. You deserve a celebration. I recommend making these. It's too cold. You need to start putting on more weight to stay warm. I am confident these will do the trick. Or maybe you're just hungry and have great taste. Make them. No matter who you are, make them or I will find you and I will make them for you. I know there are a lot of ingredients, and there are going to be a lot of steps, but I promise it's easier than you think. So bear with me; it's completely worth it. Before you get started, line a 9-in.-by-13-in. baking pan with aluminum foil and spray it with nonstick spray. If you use a glass pan, heat the oven to 325, or 350 degrees Fahrenheit if you use a metal pan. Now comes the fun part. First, just mix together the melted butter, egg, and cake mix. If you happen to forget to melt the butter and wonder ­"what on earth is this sandy mess," which I definitely didn't do both times that I've made these, you can always throw the mixing bowl in the microwave to soften it all up. This stuff is super tasty, so do yourself a favor and lick the beaters. Using your hands and treating this mixture kind of like Play-Doh, press it down into an even layer on the bottom of the pan. Next, for the cookie dough layer, mix the butter and brown sugar together. When they're all yummy and fluffy, add the milk and vanilla. Mix in the flour and salt, and finally stir in the chocolate chips. Play with Play-Doh again and press this layer on top of the base, but leave about a half inch on all sides. Also, definitely save a little spoonful for yourself. And it's finally time for the gooey butter layer. Mix up the softened cream cheese and brown sugar. Add in the eggs and vanilla. Then mix in the powdered sugar. Pour that over the top of the cookie dough layer and bake it for 30 minutes. When you pull it out of the oven, let it cool for about a half hour. In order for it to set the whole way, put it in the fridge for at least two hours. But if you choose not to wait, it won't be as pretty but it will still taste great. I wouldn't blame you. To finish it all off, you've got to do sprinkle powdered sugar on the top. It only takes a little bit of effort, but it goes a long way toward making it prettier and tastier. Finally, get a glass of milk, sit down with some friends (or Netflix) and try not to get drool on your shirt.